Figure A65. 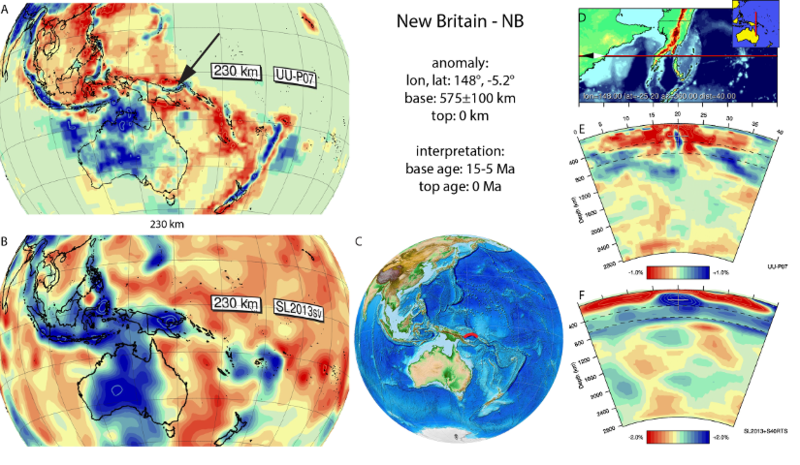 New Britain anomaly, interpreted as the New Britain slab, with (horizontal) [vertical] cross sections through (A)[D] the UUP07 p-wave) and (B)[D] the combined SL2013 and S40RTS s-wave models at 230 km; C) the location of the modern geological record that we interpret to have formed during the subduction of the slab. The New Britain anomaly (Figure A65) corresponds to anomaly A3 of Hall and Spakman (2002; 2004) and was previously imaged by Bijwaard et al. (1998). It is an E-W trending anomaly interpreted as a slab that reaches the base of the upper mantle. It is actively subducting northward along a trench south of New Britain, consuming Solomon Sea plate lithosphere. Subduction along the New Britain trench is interpreted to be a delayed response to the collision of the Ontong Java plateau with the original Melanesian subduction zone along which (part of) the Papua slab subducted below the Australian plate until approximately 26-20 Ma (Hall, 2002; Quarles van Ufford and Cloos, 2005; Knesel et al., 2008; Holm et al., 2013). The arrest of subduction of the Papua slab along the Melanesian trench was first followed by subduction of the Solomon Sea plate along the Trobriand trough (Hall, 2002; Quarles van Ufford and Cloos, 2005; Knesel et al., 2008) (perhaps also included in the Papua slab) until ~10 Ma, after which northward subduction started below New Britain creating the Bismarck arc since 10-5 Ma (Hall, 2002; Holm et al., 2013). We adopt this as the age of the base of the New Britain slab.